Objectives Identify several forms of energy. 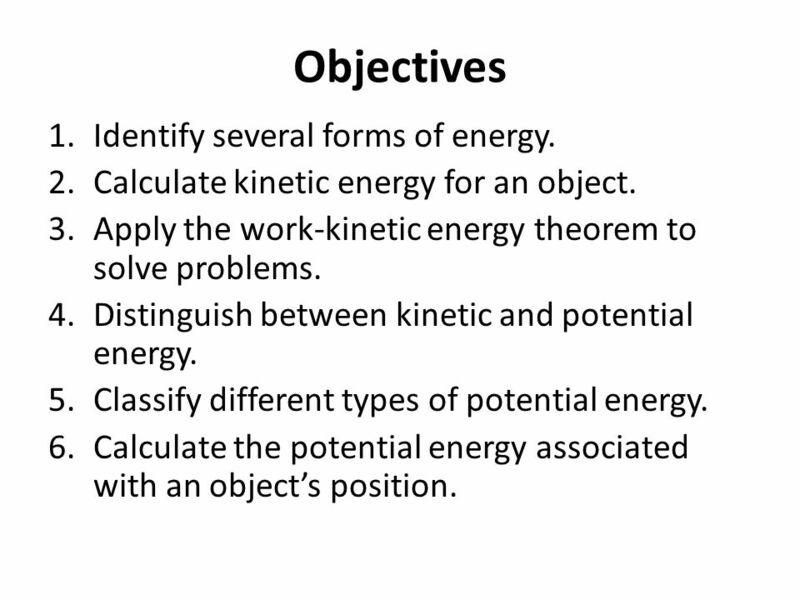 1 Objectives Identify several forms of energy. 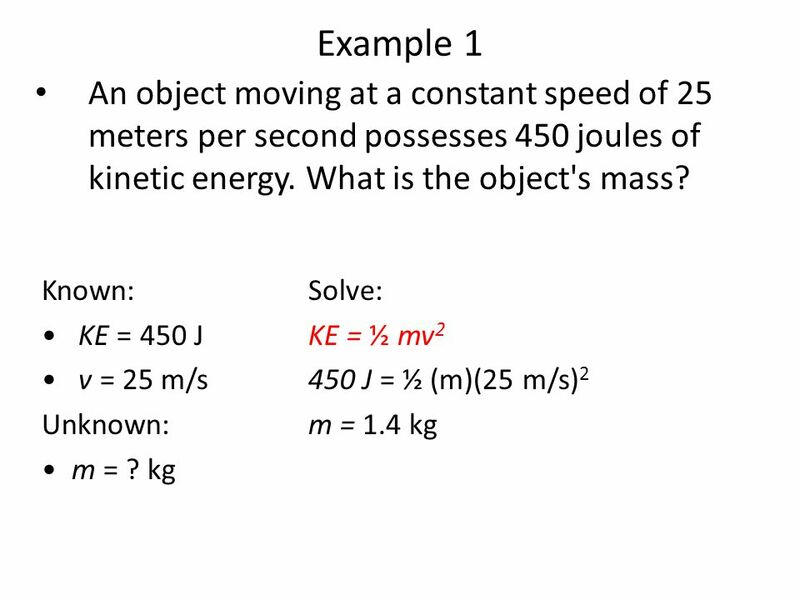 Calculate kinetic energy for an object. 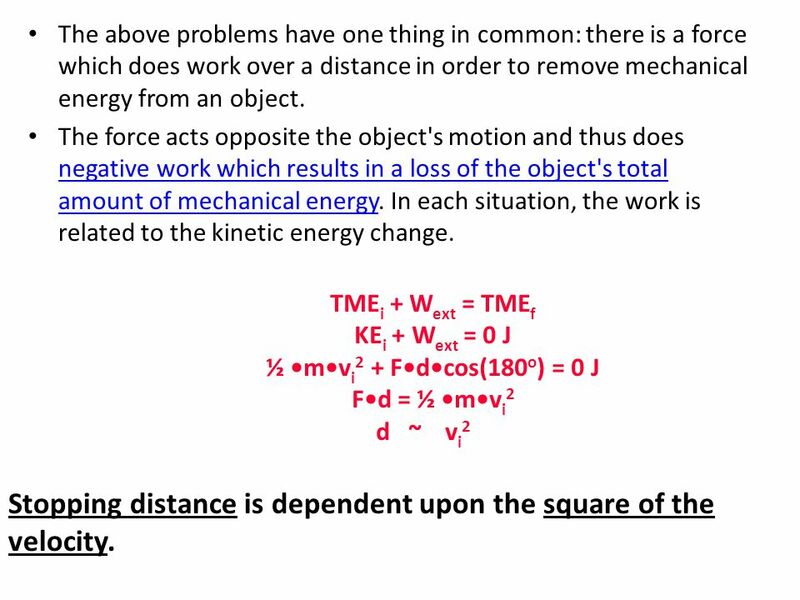 Apply the work-kinetic energy theorem to solve problems. 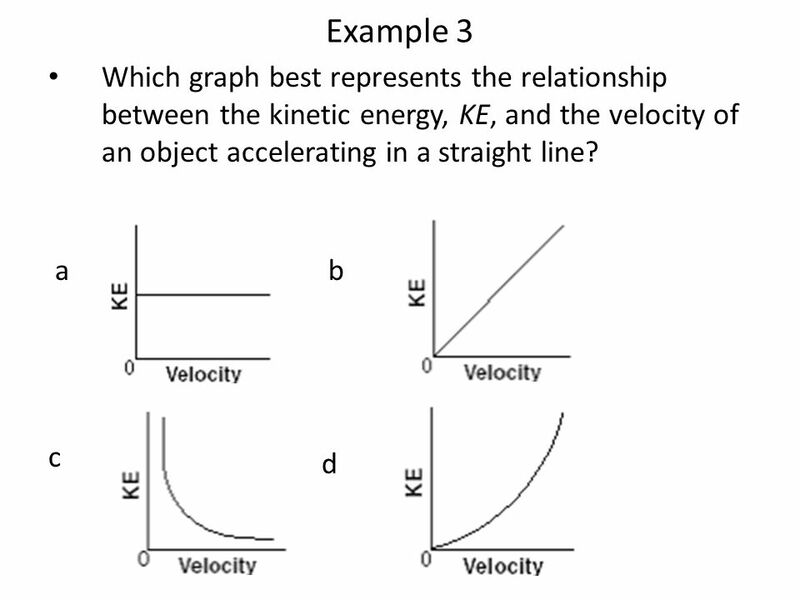 Distinguish between kinetic and potential energy. 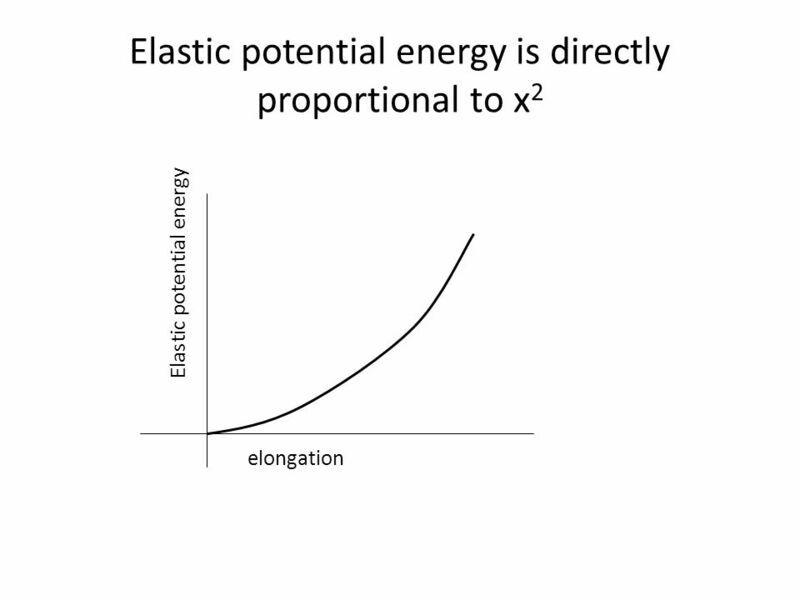 Classify different types of potential energy. 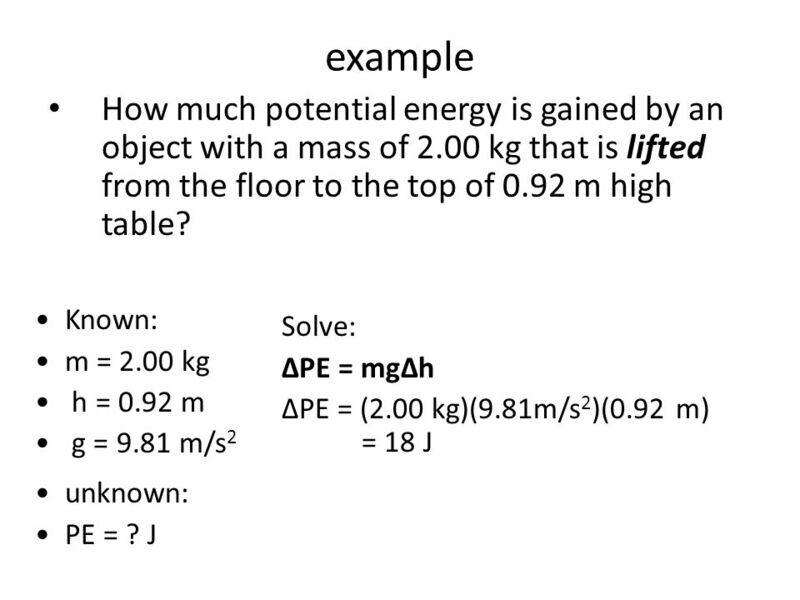 Calculate the potential energy associated with an object’s position. 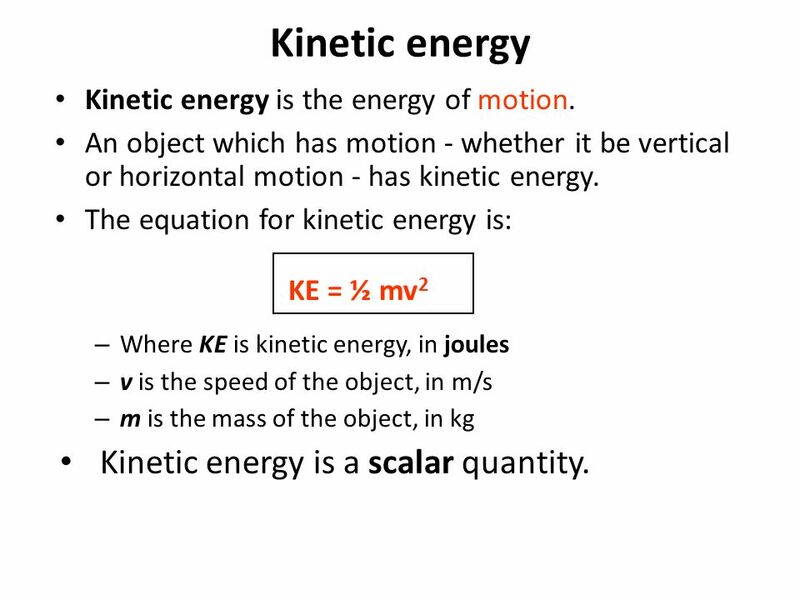 2 Kinetic energy Kinetic energy is a scalar quantity. 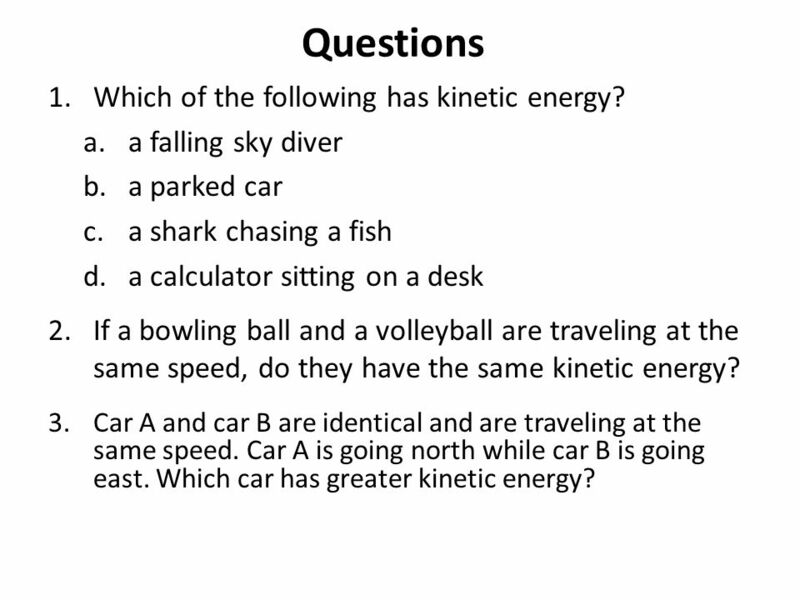 3 Questions Which of the following has kinetic energy? a falling sky diver a parked car a shark chasing a fish a calculator sitting on a desk If a bowling ball and a volleyball are traveling at the same speed, do they have the same kinetic energy? Car A and car B are identical and are traveling at the same speed. Car A is going north while car B is going east. 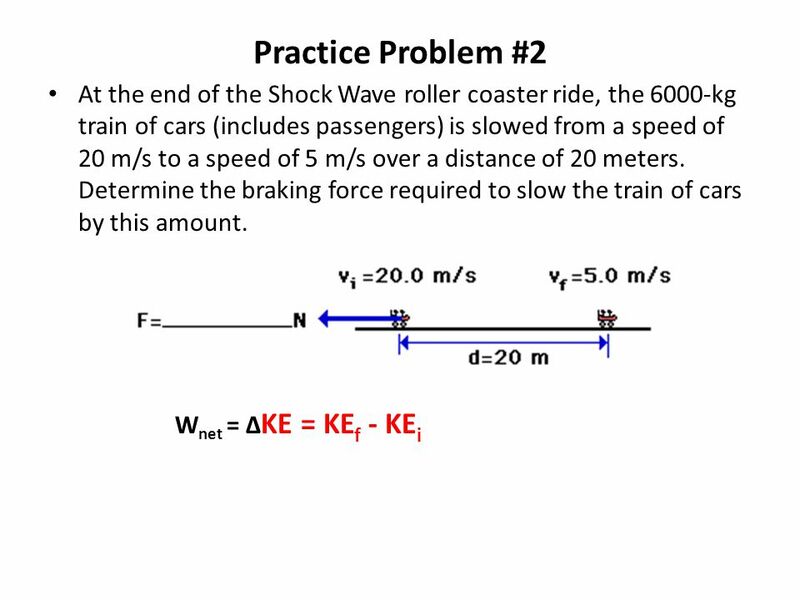 Which car has greater kinetic energy? 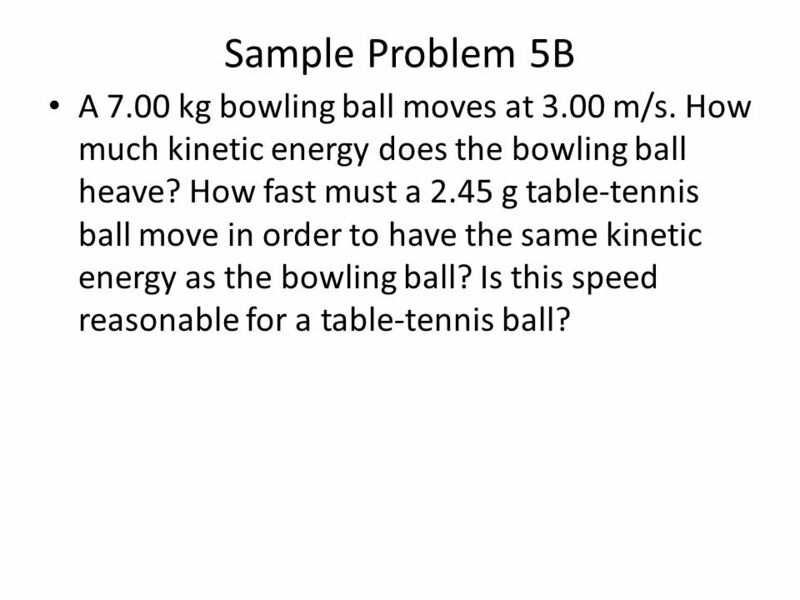 6 Sample Problem 5B A 7.00 kg bowling ball moves at 3.00 m/s. 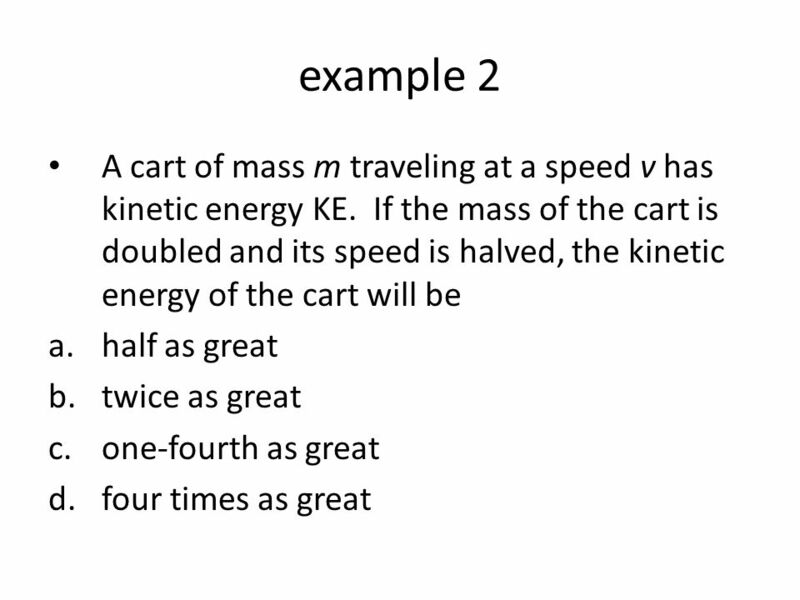 How much kinetic energy does the bowling ball heave? 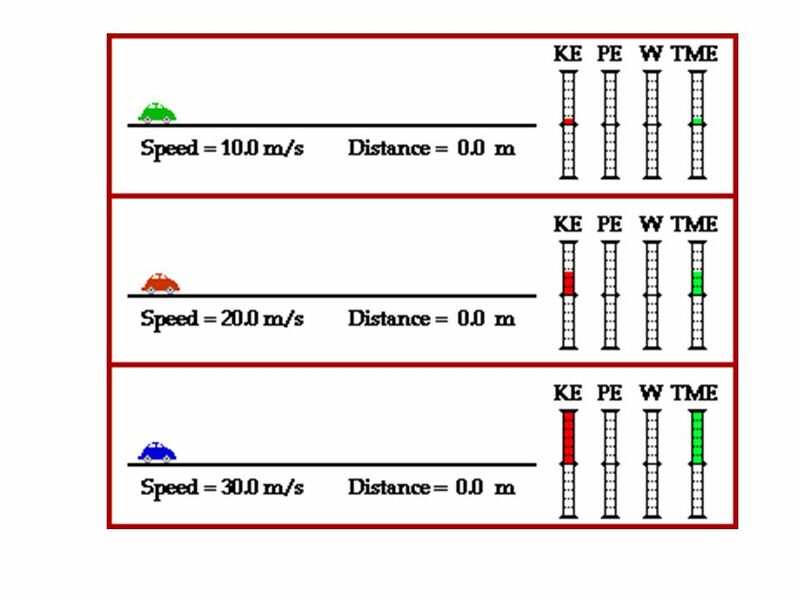 How fast must a 2.45 g table-tennis ball move in order to have the same kinetic energy as the bowling ball? Is this speed reasonable for a table-tennis ball? 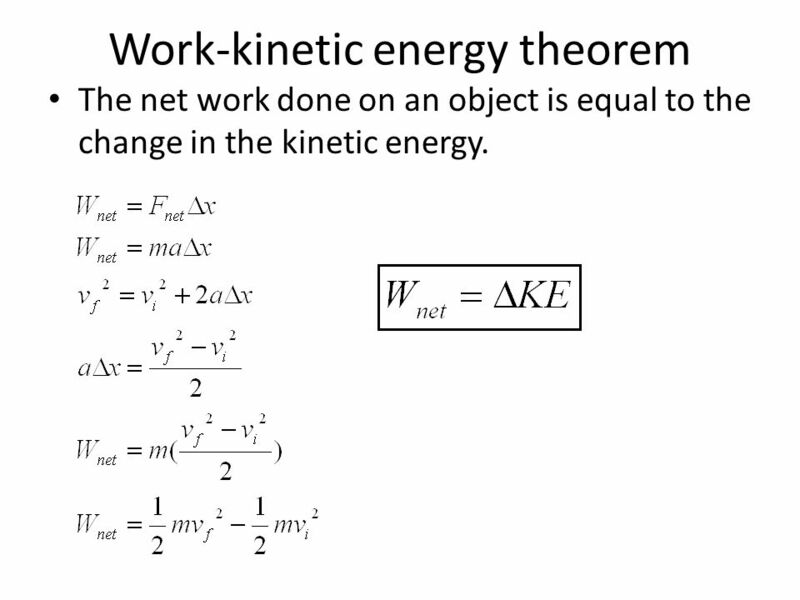 The net work done on an object is equal to the change in the kinetic energy. 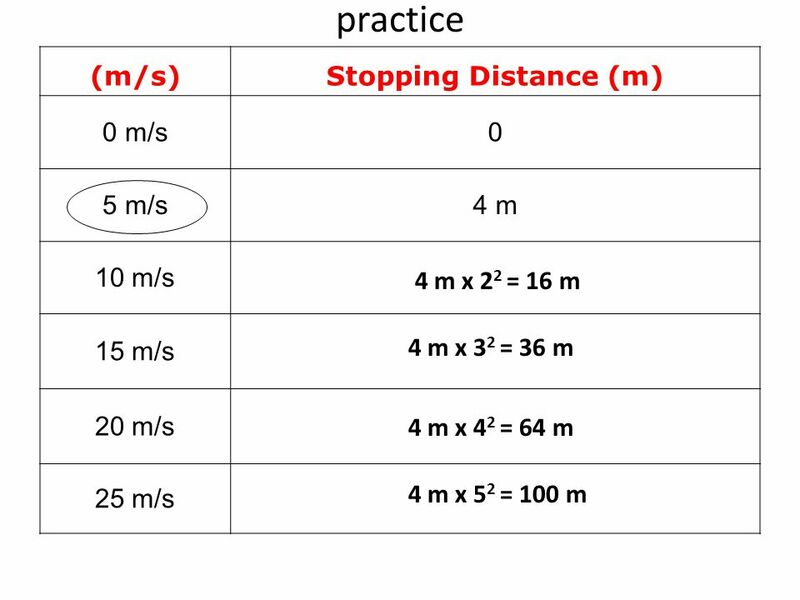 14 Stopping distance is dependent upon the square of the velocity. 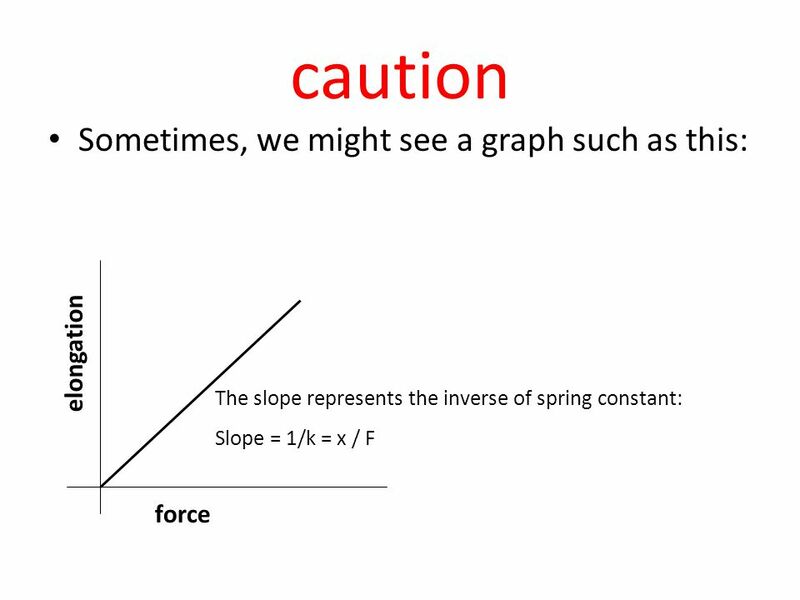 The above problems have one thing in common: there is a force which does work over a distance in order to remove mechanical energy from an object. 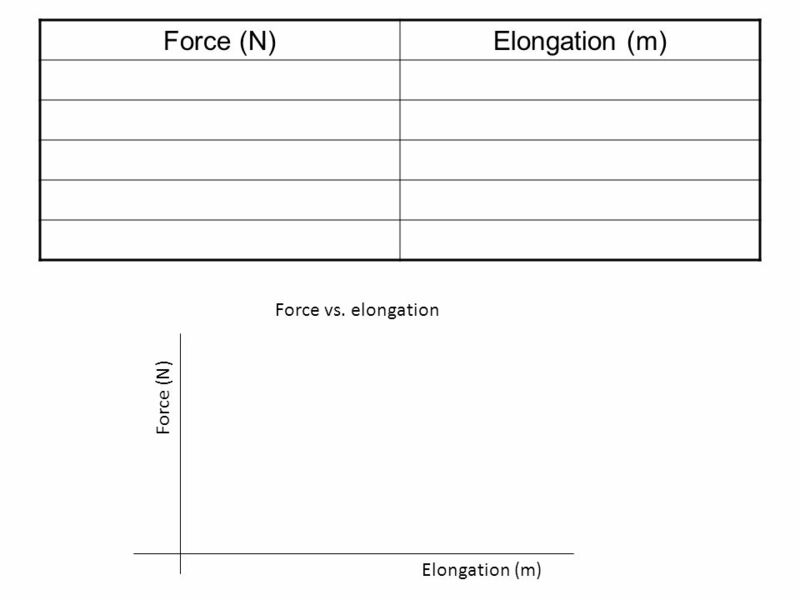 The force acts opposite the object's motion and thus does negative work which results in a loss of the object's total amount of mechanical energy. 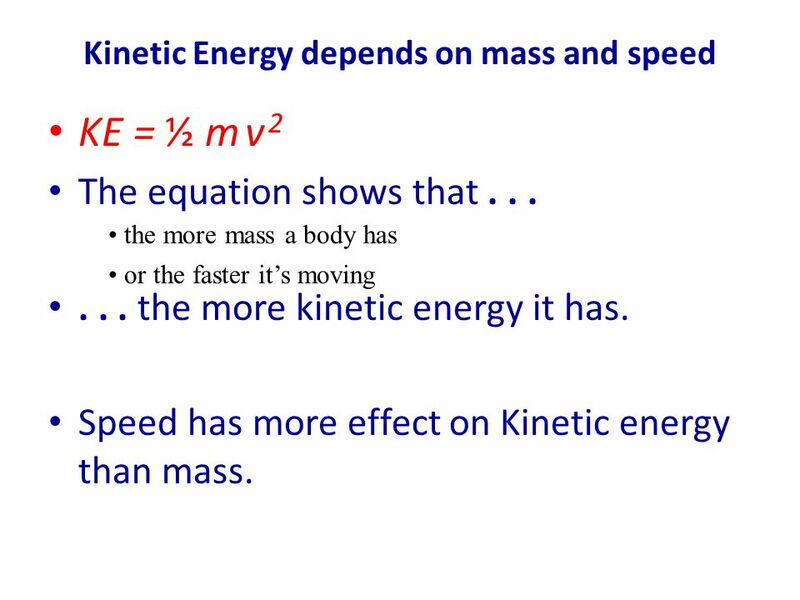 In each situation, the work is related to the kinetic energy change. 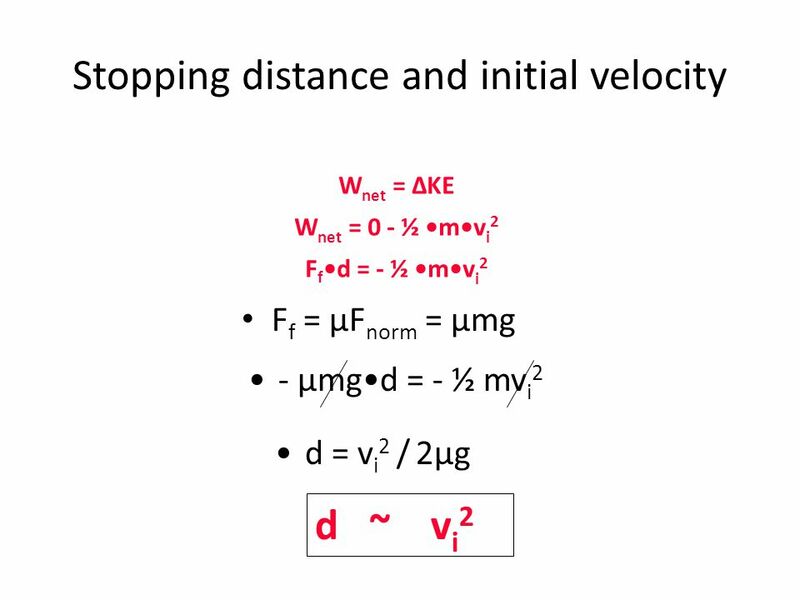 TMEi + Wext = TMEf KEi + Wext = 0 J ½ •m•vi2 + F•d•cos(180o) = 0 J F•d = ½ •m•vi2 d ~ vi2 Stopping distance is dependent upon the square of the velocity. 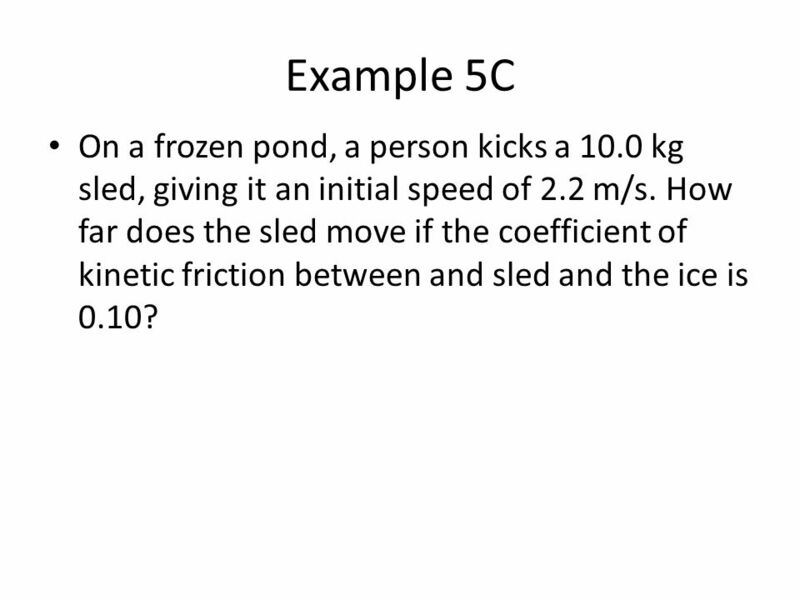 18 Example 5C On a frozen pond, a person kicks a 10.0 kg sled, giving it an initial speed of 2.2 m/s. 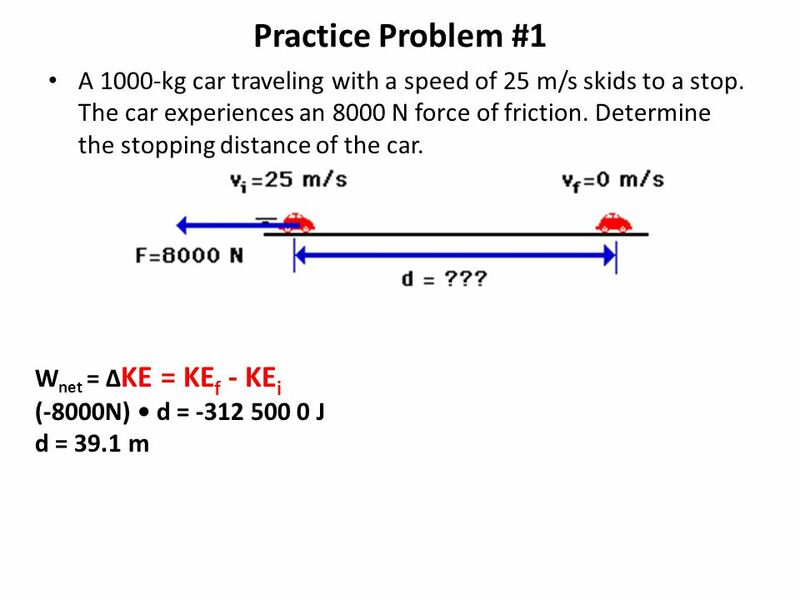 How far does the sled move if the coefficient of kinetic friction between and sled and the ice is 0.10? 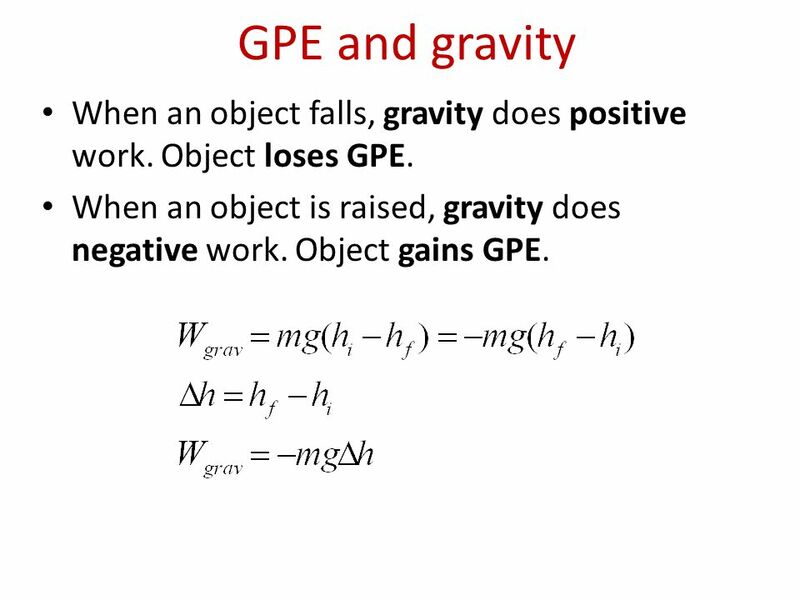 22 GPE and gravity When an object falls, gravity does positive work. Object loses GPE. 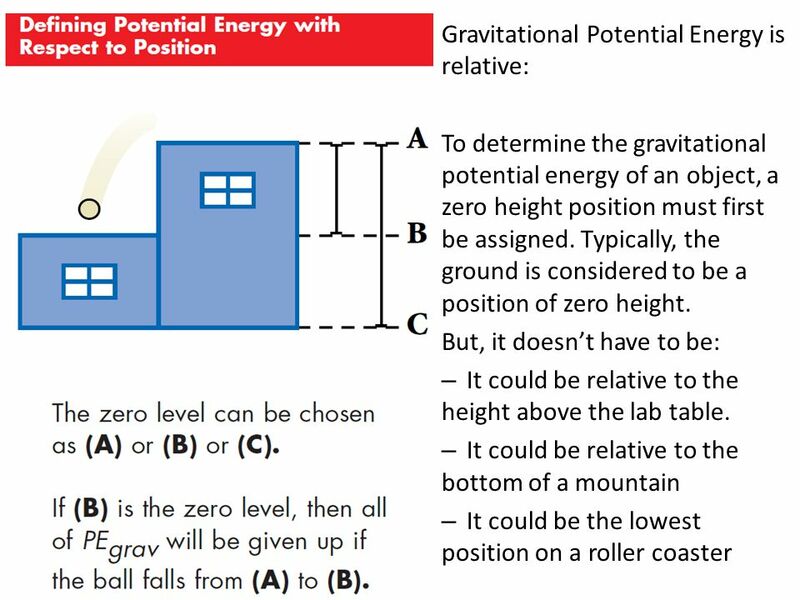 When an object is raised, gravity does negative work. Object gains GPE. 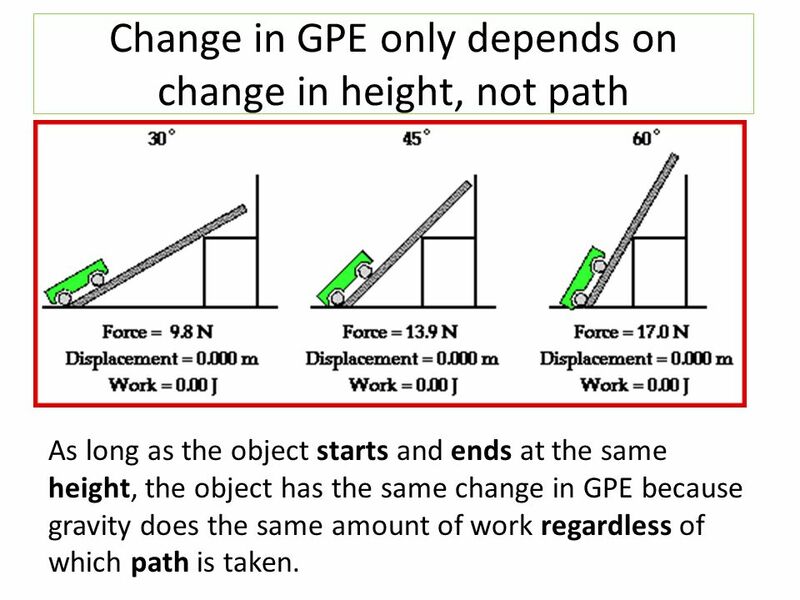 As long as the object starts and ends at the same height, the object has the same change in GPE because gravity does the same amount of work regardless of which path is taken. 24 example The diagram shows points A, B, and C at or near Earth’s surface. 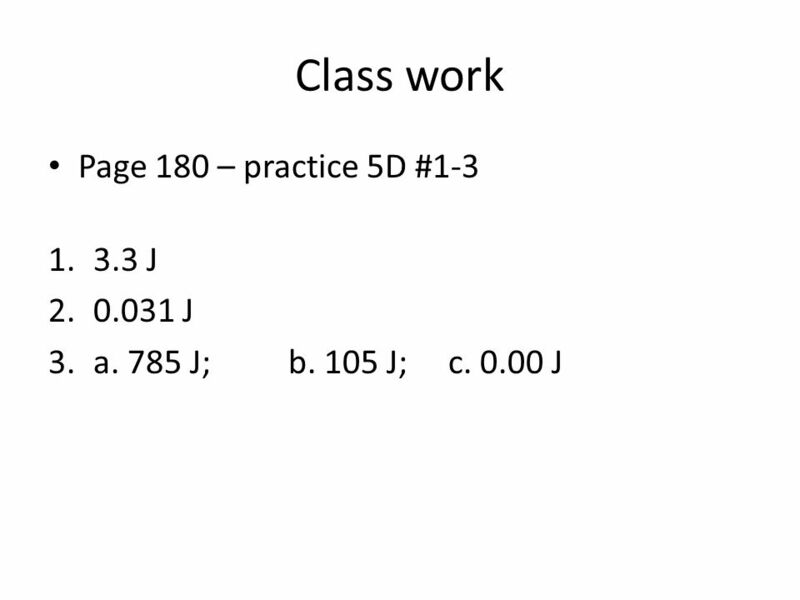 As a mass is moved from A to B, 100. joules of work are done against gravity. 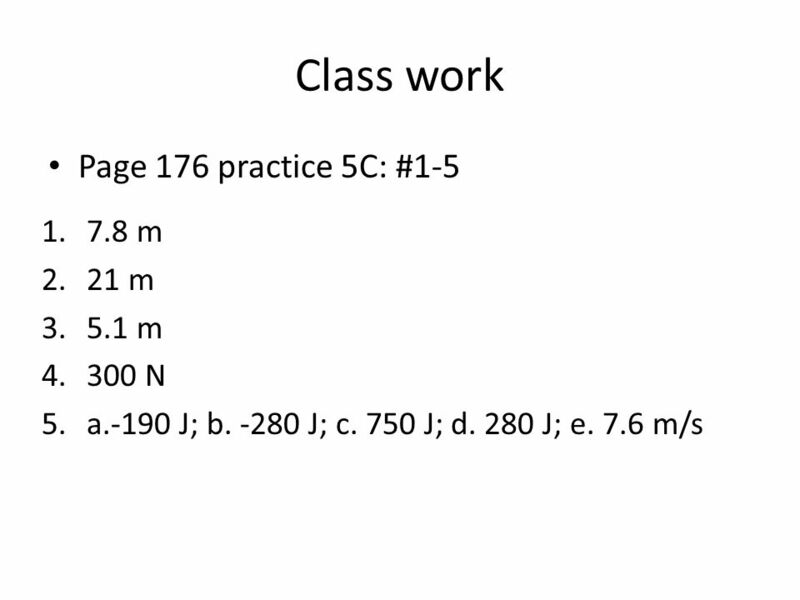 What is the amount of work done against gravity as an identical mass is moved from A to C? 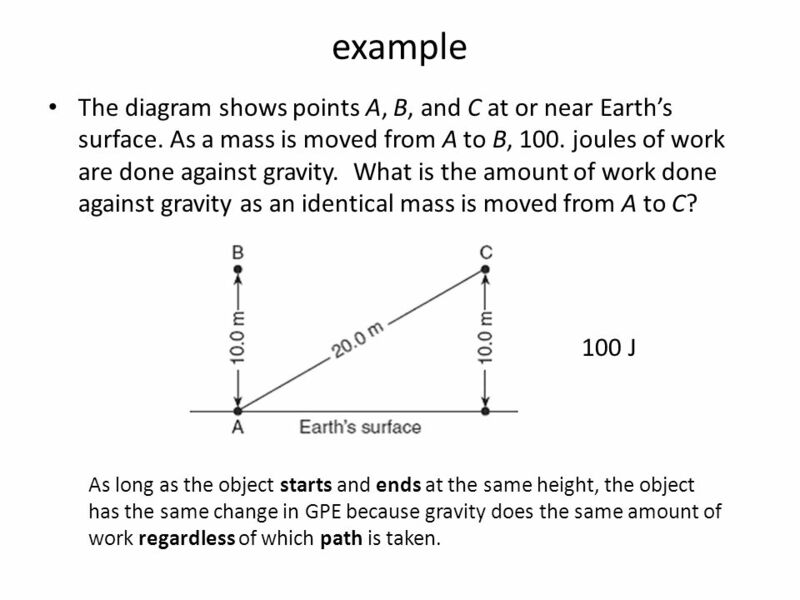 100 J As long as the object starts and ends at the same height, the object has the same change in GPE because gravity does the same amount of work regardless of which path is taken. 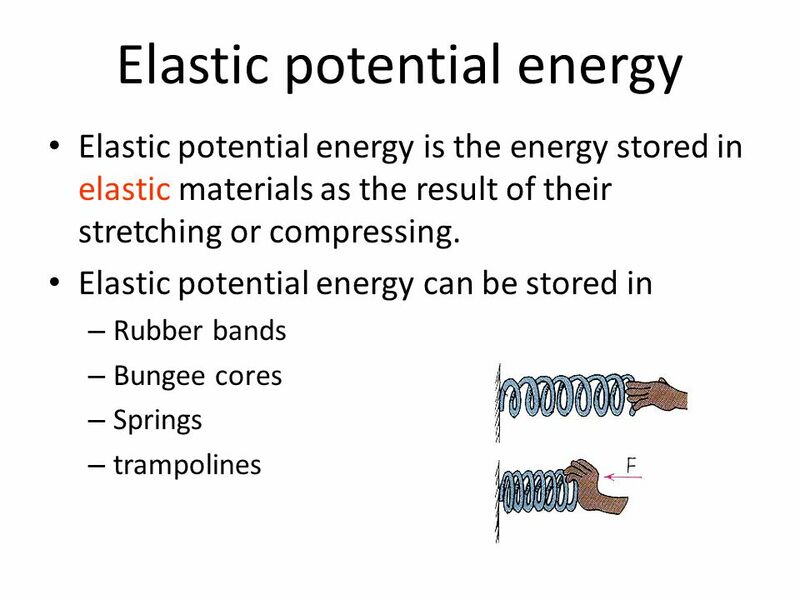 29 Springs are a special instance of a device that can store elastic potential energy due to either compression or stretching. 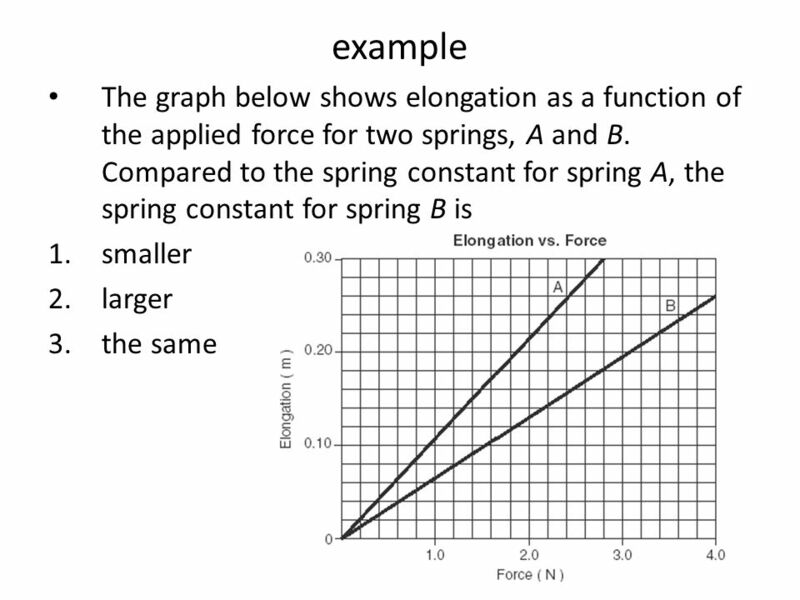 A force is required to compress or stretch a spring; the more compression/stretch there is, the more force that is required to compress it further. 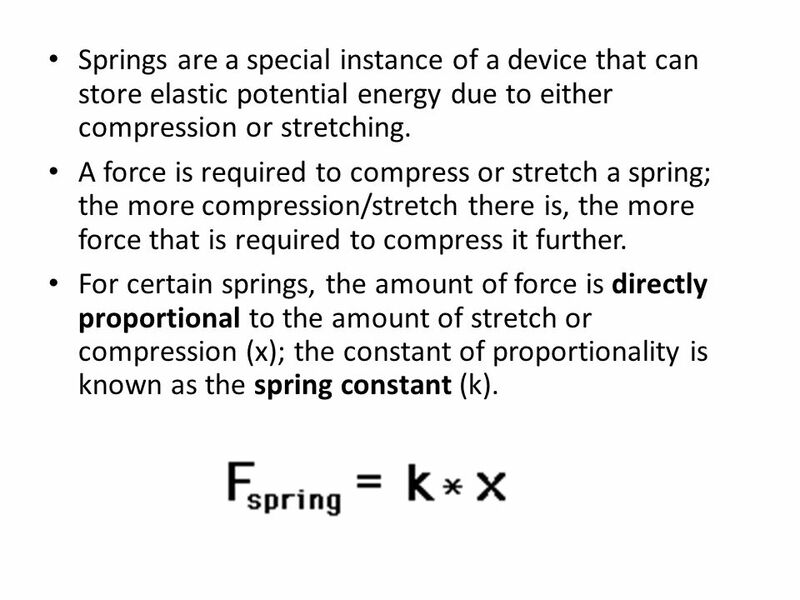 For certain springs, the amount of force is directly proportional to the amount of stretch or compression (x); the constant of proportionality is known as the spring constant (k). 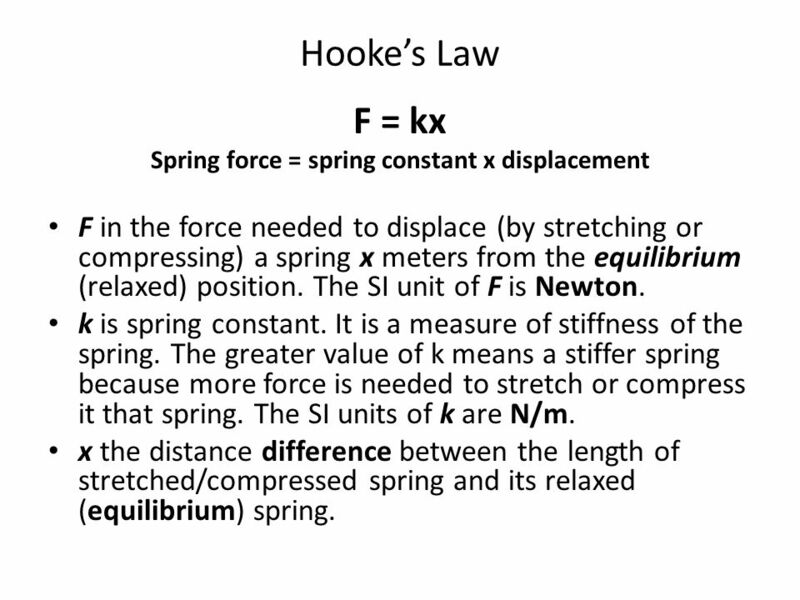 Hooke’s Law F = kx Spring force = spring constant x displacement F in the force needed to displace (by stretching or compressing) a spring x meters from the equilibrium (relaxed) position. 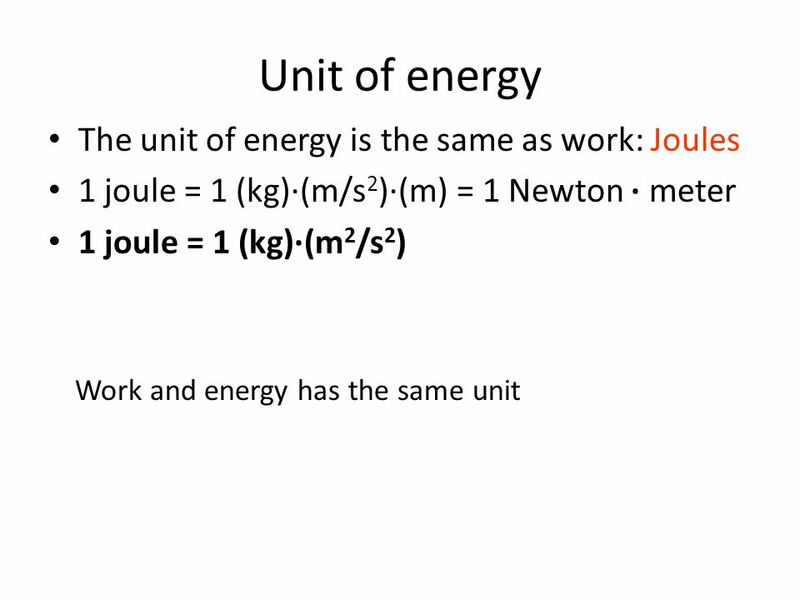 The SI unit of F is Newton. 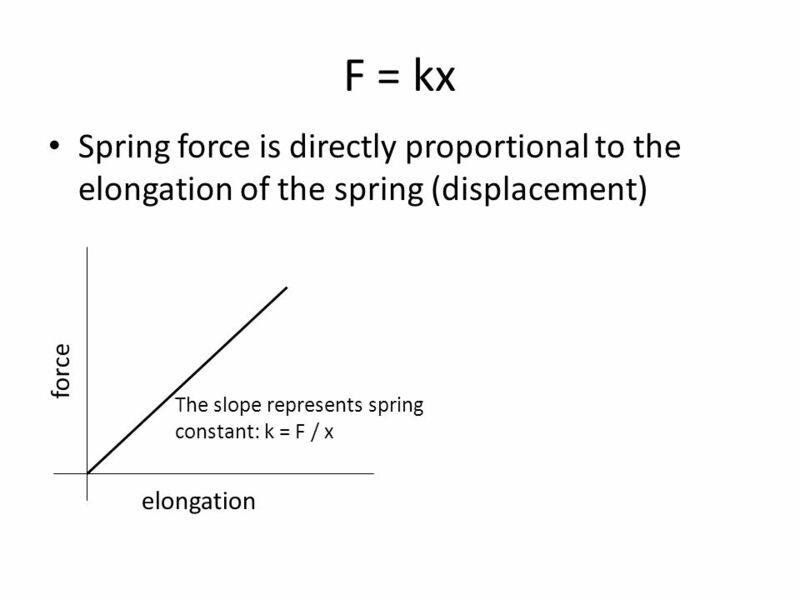 k is spring constant. It is a measure of stiffness of the spring. 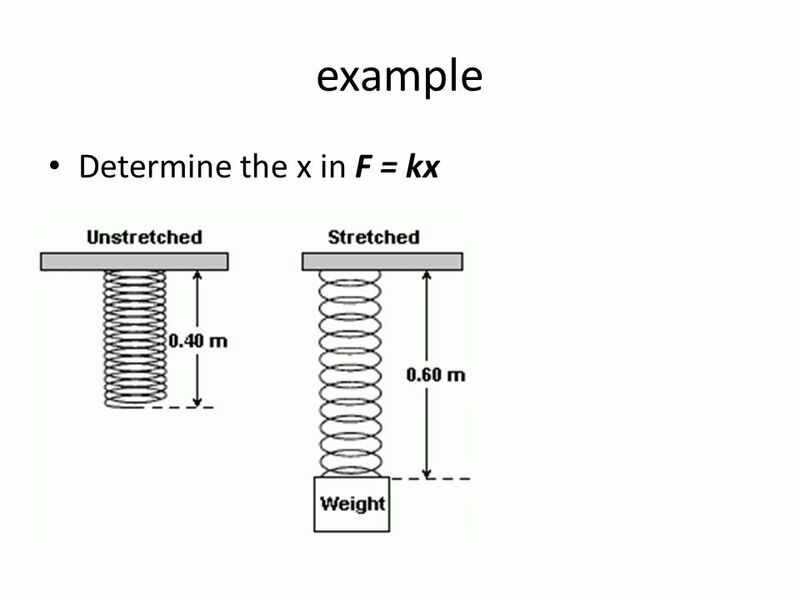 The greater value of k means a stiffer spring because more force is needed to stretch or compress it that spring. The SI units of k are N/m. 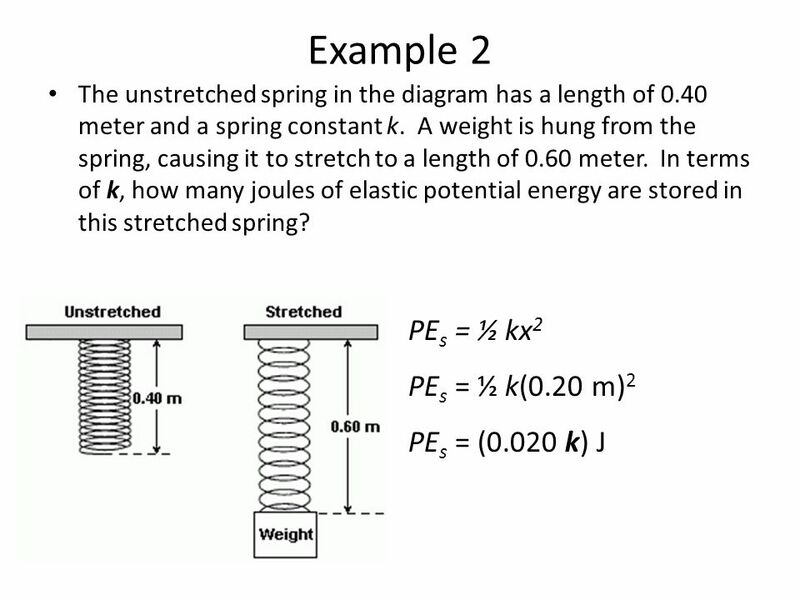 x the distance difference between the length of stretched/compressed spring and its relaxed (equilibrium) spring. 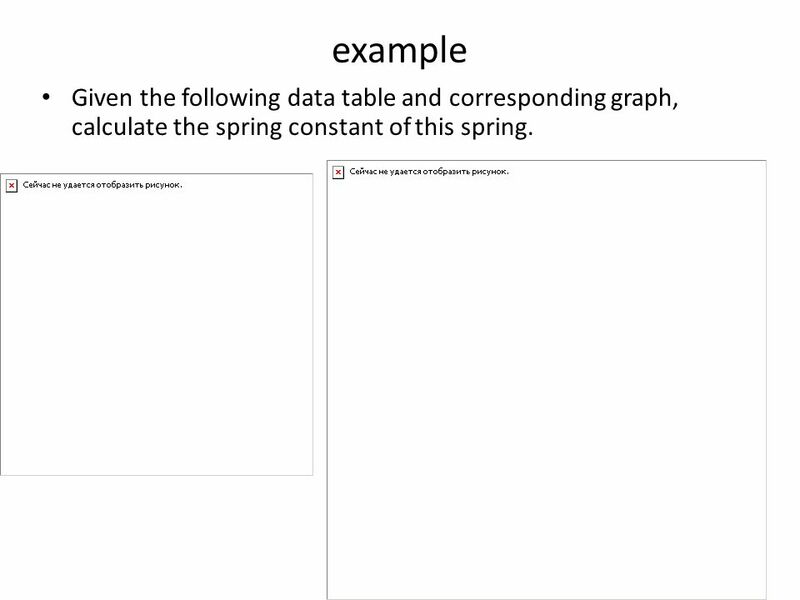 34 example Given the following data table and corresponding graph, calculate the spring constant of this spring. 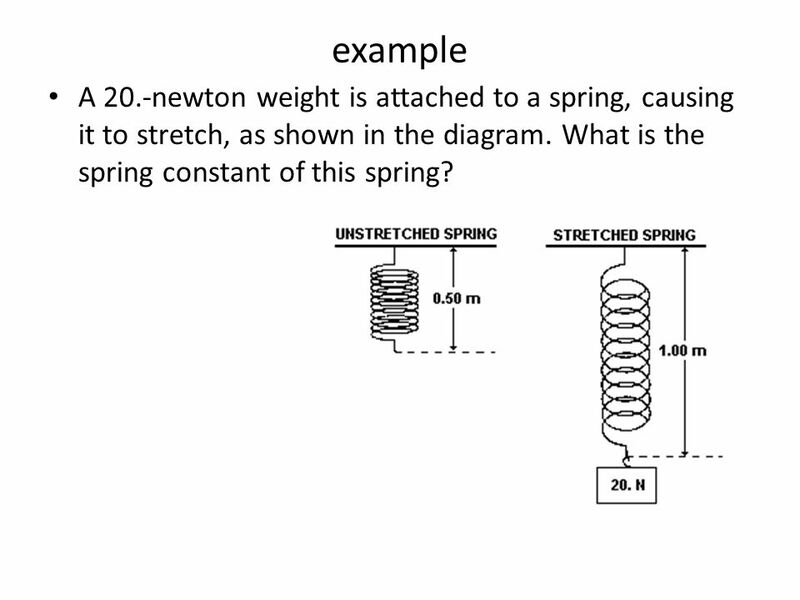 35 example A 20.-newton weight is attached to a spring, causing it to stretch, as shown in the diagram. 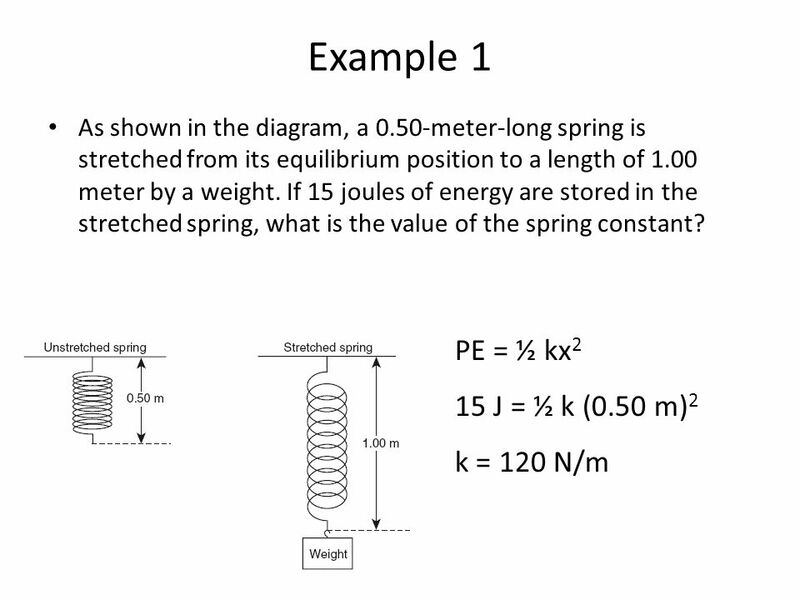 What is the spring constant of this spring? 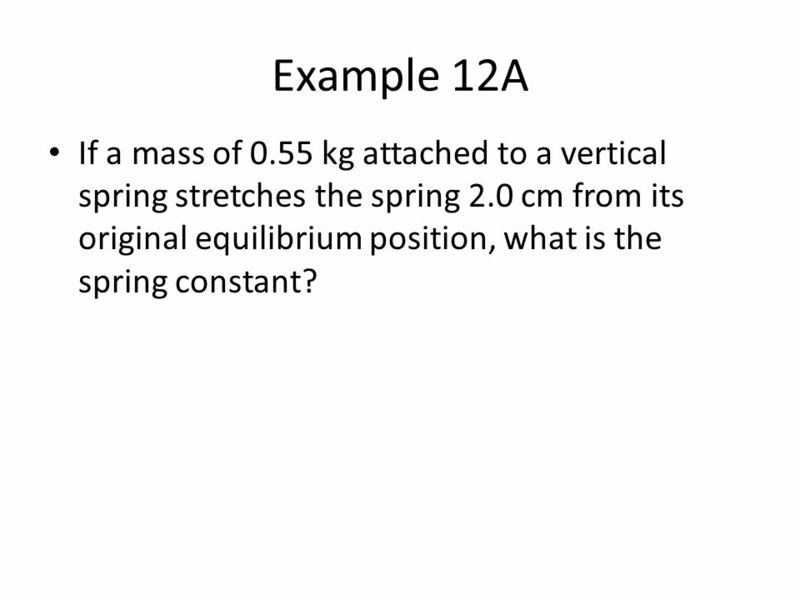 37 Example 12A If a mass of 0.55 kg attached to a vertical spring stretches the spring 2.0 cm from its original equilibrium position, what is the spring constant? 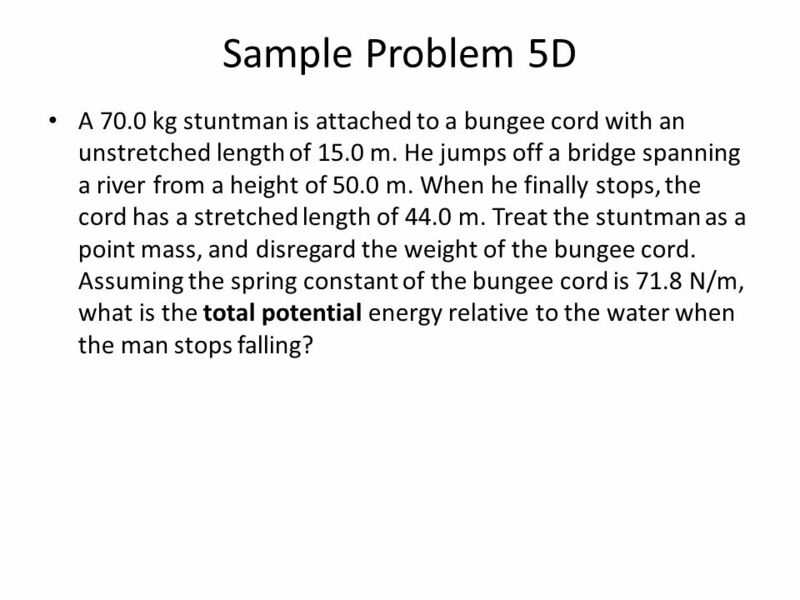 48 Sample Problem 5D A 70.0 kg stuntman is attached to a bungee cord with an unstretched length of 15.0 m. He jumps off a bridge spanning a river from a height of 50.0 m. When he finally stops, the cord has a stretched length of 44.0 m. Treat the stuntman as a point mass, and disregard the weight of the bungee cord. 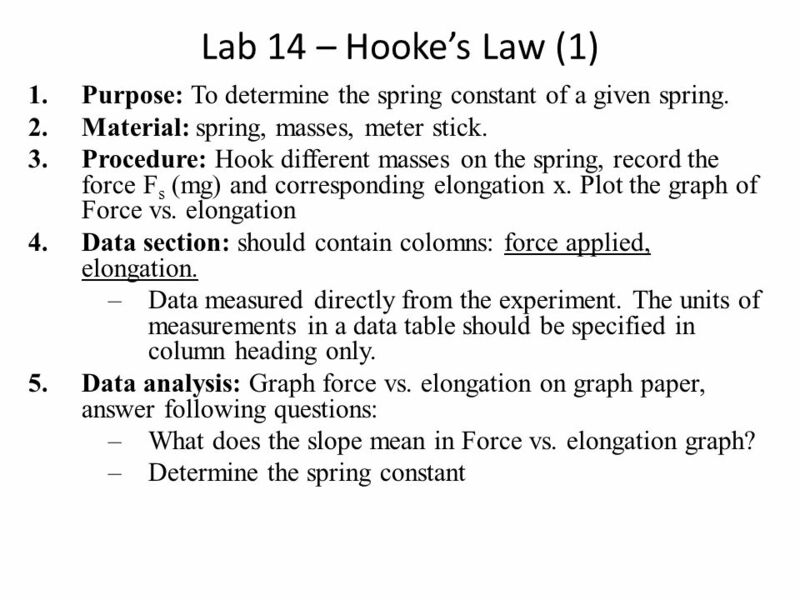 Assuming the spring constant of the bungee cord is 71.8 N/m, what is the total potential energy relative to the water when the man stops falling? 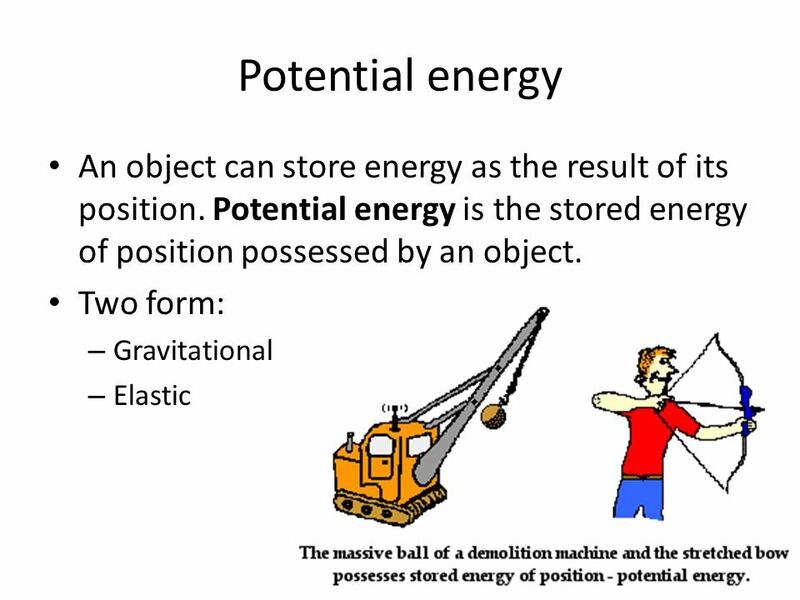 Download ppt "Objectives Identify several forms of energy." 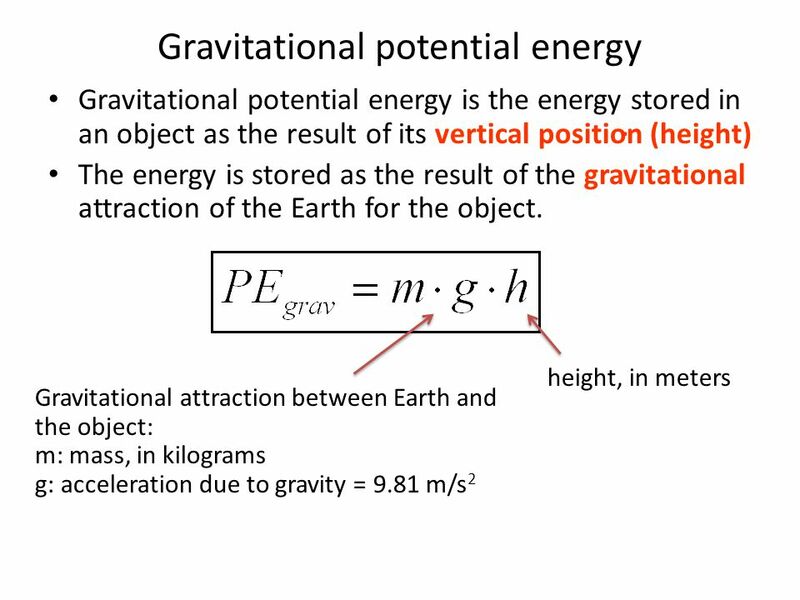 Part 1 /2 High School by SSL Technologies Physics Ex-39 Click Potential energy is stored energy because it has the “potential” of being used at a future. 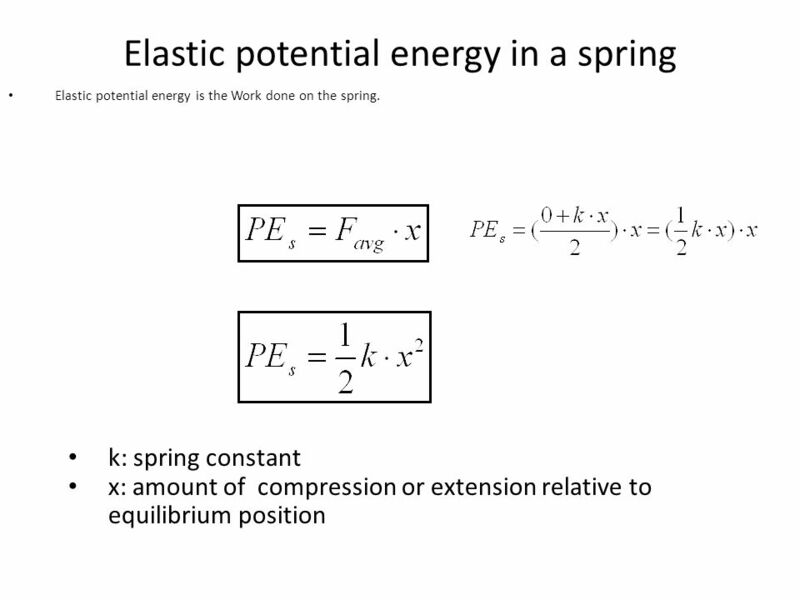 Work & Energy Physics, Chapter 5. 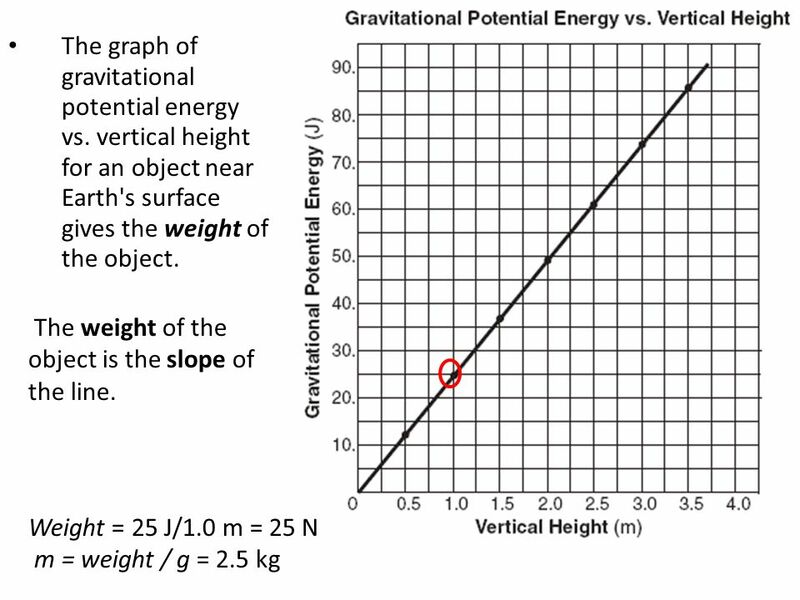 The gravitational PE of an object is proportional to A. 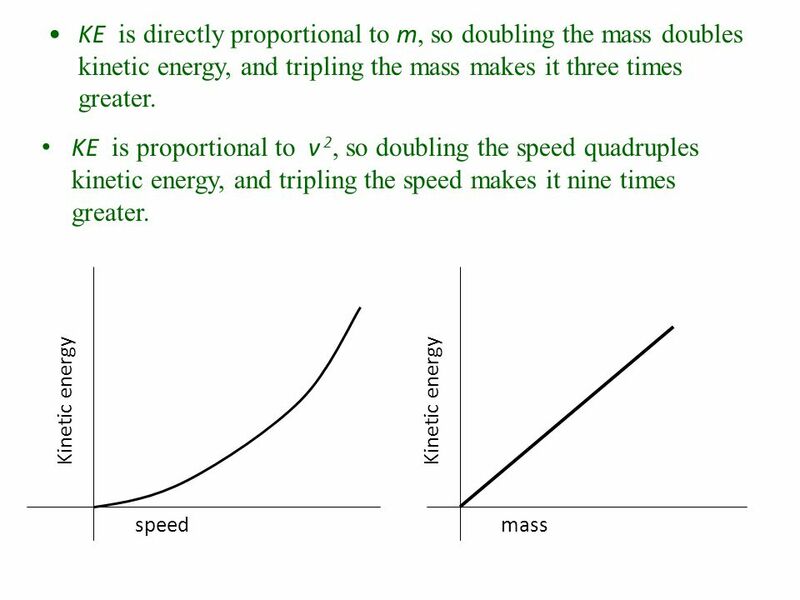 The object’s mass and its speed B. 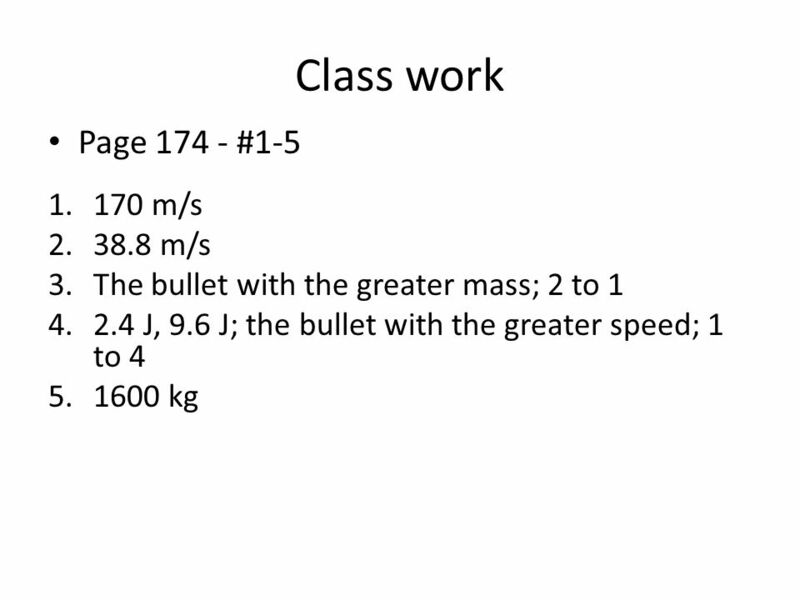 The object’s speed and its height C. The object’s mass and its. Work and Energy Chin-Sung Lin. 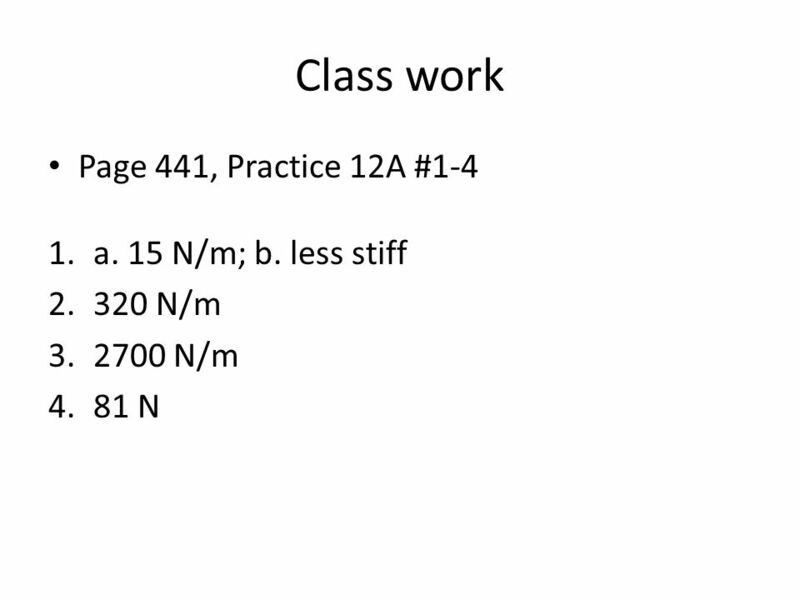 Potential Energy Work Kinetic Energy. Work, Energy, And Power m Honors Physics Lecture Notes. Unit 5-2: Energy. Mechanical Energy When mechanical work is done, mechanical energy is put into or taken out of an object. Mechanical energy is a measurement. Chapter 5 – WORK and ENERGY. 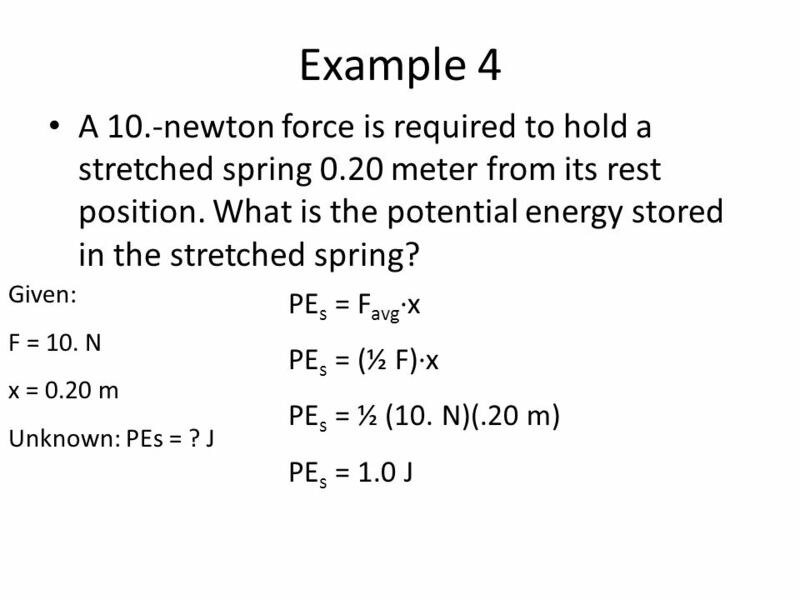 5.2 MECHANICAL ENERGY. 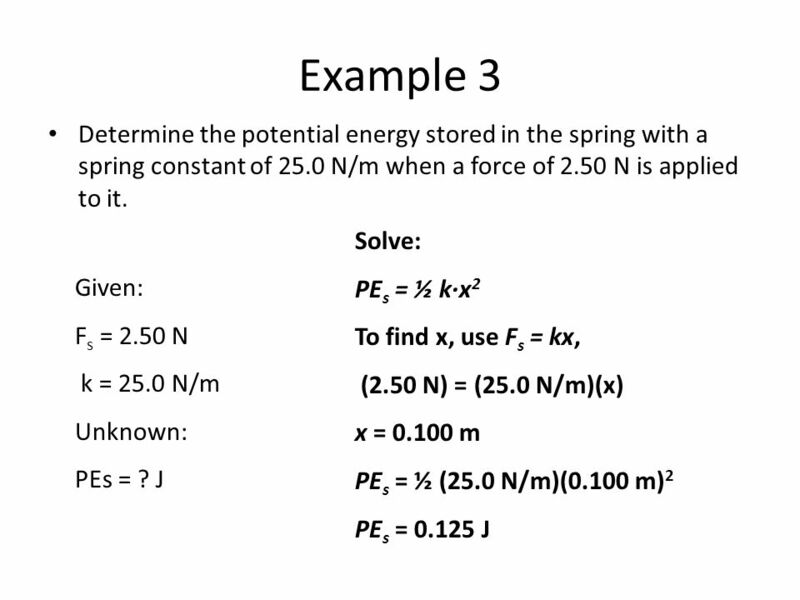 Regents Physics Work and Energy.